DJI wants everyone to be able to fly a drone. 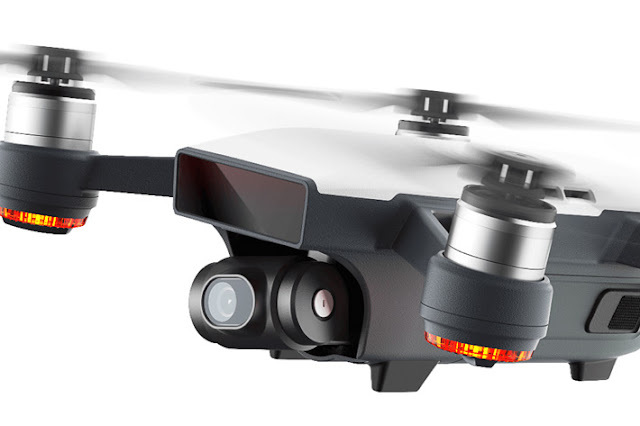 At least, that's the message it seems to be sending with the Dji Spark ($499), the company's smallest aircraft yet. 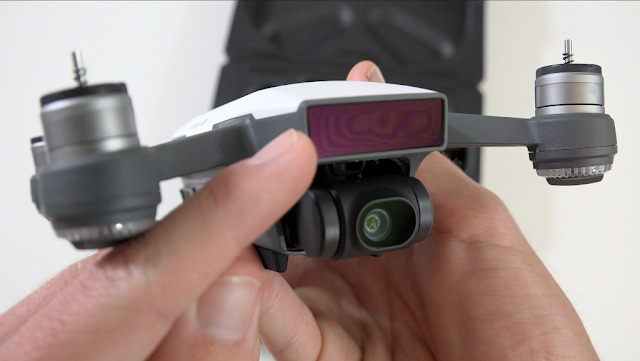 It's a selfie drone you can interact with just by waving your hand. It's also a short-range quadcopter that can be controlled with your smartphone, complete with forward obstacle avoidance and subject tracking capabilities. Add an accessory remote and you've got a very capable bird, with a 31mph top speed and a robust operating range. The camera sports a 1/2.3-inch CMOS image sensor, the same type you find in a typical pocket superzoom and slightly larger than the sensor in an iPhone. The lens is a fixed 25mm f/2.6 equivalent, capable of capturing 12MP still images and 1080p video at 30fps and 24Mbps. Related: Dji Spark vs Dji Mavic Pro Comparison: Which is Better? You don't get the option to shoot at 24fps for a more cinematic look, and there's no 60fps or 120fps capability to record smoother footage for slow-motion playback. 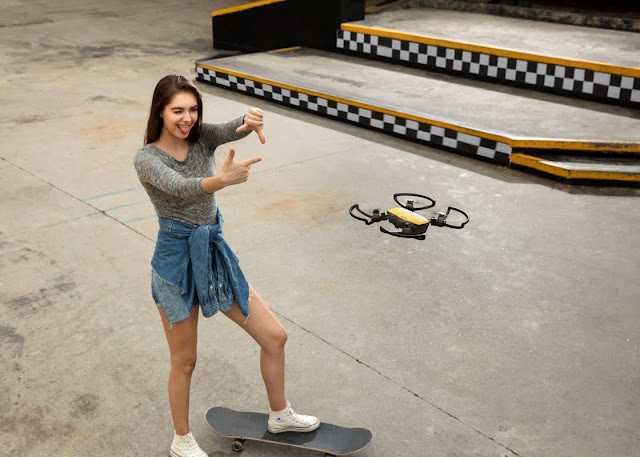 This isn't as serious a video tool as other DJI drones, like the Mavic Pro $999.00 at Amazon, which supports 4K capture and additional frame rate options. A two-axis mechanical gimbal keeps footage stable during flight. Spark adopts all previous DJI drone shooting modes while adding two new modes: Pano and ShallowFocus. Spark shoots horizontal or vertical panoramas by automatically adjusting its gimbal and heading. 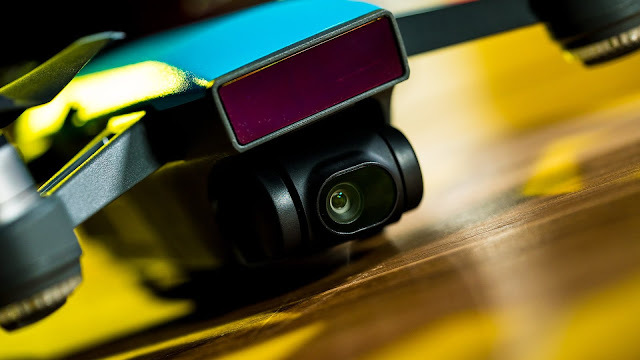 Spark uses its 3D vision technology to create photos with a shallow depth of field. With its aerodynamic, lightweight, and slick design, Spark soars through the air with minimal wind resistance. The gimbal and camera are flush with the aircraft, significantly increasing stability. Powerful propulsion offers steady flight in strong winds at up to 31 mph (50 kph) in Sport Mode.² And an advanced flight control system means flying is fun and intuitive. Deep learning gesture recognition allows you to take dronies with simple hand motions. With PalmControl mode, control Spark’s movement by hand. If you want, leave your remote controller and phone at home. Raise your arms, wave your hand, or make a frame with your fingers to maneuver Spark and shoot photos. Spark can follow your hand movements or even take off and land on your palm. The more advanced elements of gesture control were really fun when they worked, but a little bit less reliable. If you wave one hand like you’re saying goodbye, the Spark will fly away and up to a distance of about 20 feet. From there you can make a square around your face with your forefingers and thumb like an old Hollywood director checking the frame. That instructs Spark to snap a photo. Finally, to bring it home, you make a big Y with your arms above your head. I got all these commands to work, but I often had to repeat them multiple times. I still haven’t figured out exactly what the right posture or movement is to make sure the Spark gets it every time. If you want to go beyond the photos and distances offered by gesture mode, you need to pair the Spark with the DJI Go 4 mobile app. The unit puts off a Wi-Fi network and in my testing it was simple to find and connect to. Related: Top Dji Spark Accessories You Should Have! Once you’ve got the app open, you can see a live video feed from the drone’s camera. You can fly using your thumbs on the screen; in my testing, the unit responded quickly and precisely to these digital controls. If thumbsticks are too challenging, the Spark offers a couple other options for piloting. There is TapFly mode, where you simply click on the screen to indicate which direction the unit should go. The Spark, despite its small size, has sensors that allow it to detect and avoid obstacles when moving forward. You can use TapFly to get a lot done, but it’s less precise than a controller and the drone will often decline to move through tight spaces. The Spark is easily one of the best portable drones available right now. Despite the fact that it can’t shoot 4K video like some of its competitors, it outshines the competition in just about every other regard. It’s faster, smarter, can fly for longer periods of time, and is definitely the most reliable in its class — so if you don’t mind shooting in 1080p, this drone would make a fantastic companion on your next adventure. At last I found the flying camera which I want to get for long time. I hope I can take more difficult image with this drones with cameras and I can enjoy the world so more with this. So thank you so much to share this content with us. Your style is unique in comparison to other people I have read stuff from. Many thanks for posting when you have got the opportunity, Guess I all just bookmark this blog. I am glad to reach to your website, however our website also offer similar content and we would definitely like to recommend your website to our friends. Aside from this, you additionally need to ensure that best rc drones clients can adjust to the sudden occurrences that can demolish your shoots. You will be exposed to new approaches of living that are choosy to the tastes of your consumers, which may additionally optimistically supply you greater coverage to the globe round you.